What better way to celebrate Shavuot and the land of Milk and Honey than with this simple, but elegant appetizer highlighting the first fruit offering brought to the Temple in the spring. Serve anytime during the warm months when fresh figs are abundant. Many people who have lactose intolerance find goat cheese tolerable. an alternative choice would be lactose-free cottage cheese. Place figs on a plate cut side up. 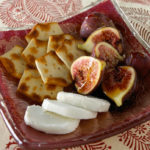 Spread some of the goat cheese on each fig. Drizzle with some honey and serve. Alternately, serve a plate with all of the ingredients and allow your guests to prepare their own. You can also serve them on a bed of lettuce as a first coarse.